As of July 2009, I've been online for 3 months and am happy the way this website is developing. Thought I'd take a bit of a time-out and develop this space to tell you a little about myself. Over the past couple of years, I have been developing a strong personal philosophy about my photography. For example, I will post-process my images once they're on the computer. In the age of digital imaging, it's important to leverage some of the possibilities offered by digitally manipulating an image. In other words, if I can spend 5 or 6 minutes in a software package - crop an image to be more appealing, enhance the saturation - which occasionally means converting to black and white or even using sepia tone, maybe sharpen (or soften) an image to create a specific mood - then WHY NOT. The key is, I always works within the limits of what is presented by the image as it comes out of my camera, and even then, only for a very short time. 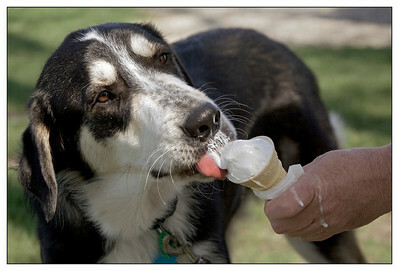 While I prefer to be out in the field, I have also taken advantage of photographing captive animals . It offers a quick and efficient way to build a portfolio (around my regular day-job) and provides opportunities which one may never come across in the wild. In some cases, it also offers photographic opportunities with animal species not readily available in the foothills of southern Alberta, which is where I call home. Over time, I hope to develop the photos in this particular gallery to be a sort of photo-blog space. Comments are most welcome, you're invited to either leave them on this site or email them to karenkanephotos@nucleus.com. I hope you enjoy touring my website! I live in Black Diamond. 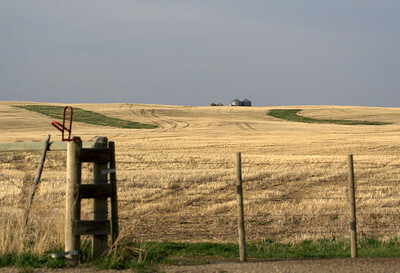 It's a small town in the Alberta Foothills, about 1/2 hour (driving) south of the city of Calgary. 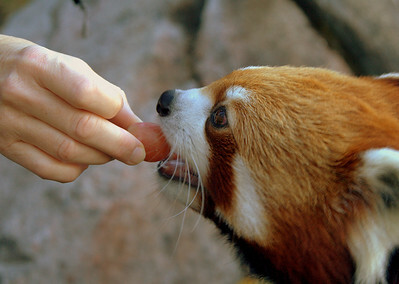 As you can see, we got to hand-feed the pandas... what a treat!! As the sheep move on by, Kavi seems to wonder if we can also get going. 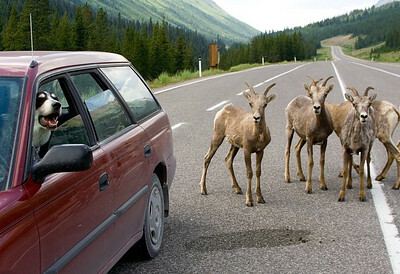 It's quite special to be able to bring him around wildlife so readily (there is no one in the car holding him back). An occasional perk of knowing someone with an exotic pet or working with captive animals is getting to hold them. 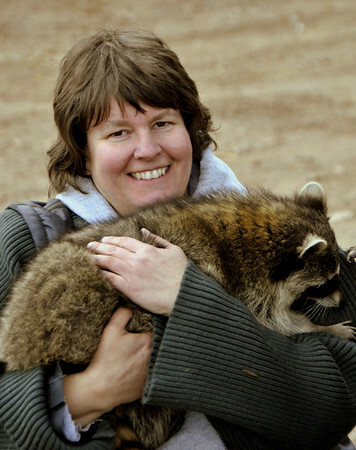 I remember as a young child knowing someone in Ontario with a pet raccoon - it chewed EVERYTHING!!! For safety reasons, most of the facilities I've photographed at will not let you interact with their animals - so this was a rare treat! 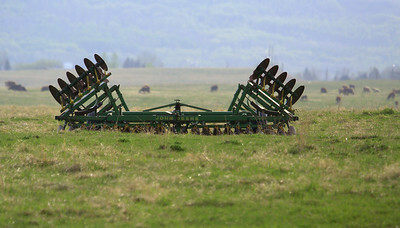 Cattle and farm equipment are typical landscape elements in this part of the world. 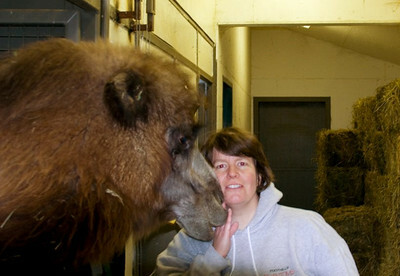 Receiving end of a "Camel kiss" from one of the Bactrian camel sisters Eva and Zsa Zsa..... although now I don't remember which one is kissing me. Yes, my dogs are spoiled. After coming around with me for a few hours and patiently waiting while I did my camera thing, he pretty much deserved something (we each had our own cone)!!! 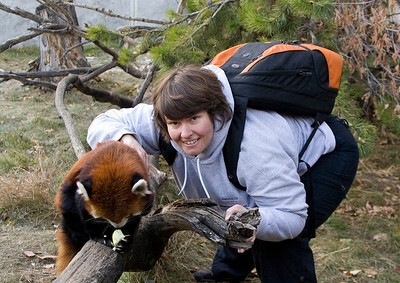 The potential of working with and photographing captive animals really sunk in after this - November 2007 a friend gave me a gift and registered me in the "Red-Panda Zookeeper Workshop" at the Calgary Zoo. I got to spend 1/2 a day with the zookeeper who looks after the red pandas (my favorite animal at the time), as well as the fallow deer, pot belly pigs and the bactrian camels. 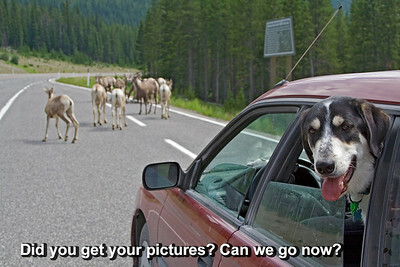 Many of the photos on this site begin with "I was taking my dogs out ....". This is Kavi in my car on Alberta Highway 40, near Highwood Pass. As you can see, he's quite indifferent towards the sheep (and it's confusing them). 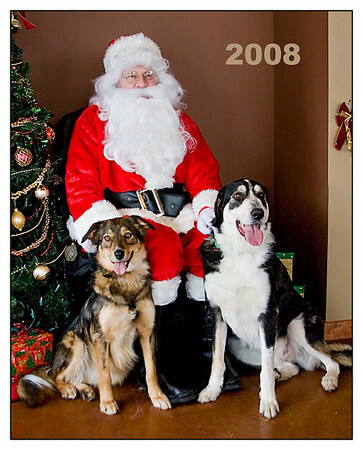 Kavi and Daisy with Santa in 2008 - I took this at my vet clinic and it seems to be an annual tradition now.